If you're thinking about a career in civil engineering, or would like to find out more about it, ICE is here to help. We can give advice and guidance if you're wondering what subjects to study at school, college or university. We also provide resources and support for teachers, and other people looking to promote civil engineering. ICE North East has a wide range of materials for people living in the region and working with local schools and colleges. Need help planning your lessons? Thinking about visiting a school? We have a range of resources for teachers and those wanting to visit schools that help explain the role of civil engineering and inspire young learners. 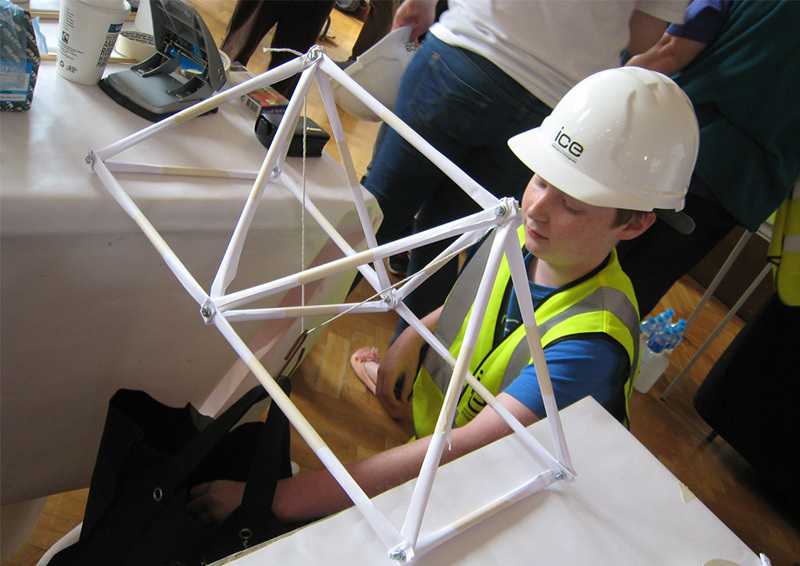 Bridges to Schools is a fun activity that introduces young people to civil engineering and its contribution to society. ICE North East uses a 13m cable stayed bridge kit which students build, walk across and deconstruct. It helps them learn about teamwork and the civil engineering that's involved in building bridges. The overall aim of Bridges to Schools, which has been running in the North East since 2012, is to inspire and motivate younger students to take up a career in science or engineering field. Students are encouraged to improve their knowledge in physics, maths and other related subjects. The bridge kit is normally kept in one location for a week and schools group together to arrange for their pupils to visit and take part in the activity. To host the bridge you need a gym or hall that's 19m long, 2.5m high and has a flat surface. Vehicle access is needed as close as possible. It's very important that this space is available or the bridge won't fit. If you're interested in hosting Bridges to Schools at your school please contact Jade Robson in the ICE North East Regional Support Team for availability and pricing. This is a hands-on design, make and test activity. Pupils will use sheets of paper, masking tape and nuts and bolts, to create a bridge which is tested for strength. The activity helps students to appreciate the role of civil engineers and provides a great understanding of the forces that need to be managed in order to build a safe structure. Including rail and footbridges there are 26 bridges over the river Tyne. The bridges between Newcastle and Gateshead are probably the best known. The river is also crossed by the Tyne tunnel - a 2 lane road tunnel that connects Jarrow with North Shields. Famous engineer Robert Stephenson’s High Level Bridge was the first to span the Tyne Gorge in 1850. The Gateshead Millennium Bridge was the most recent in 2001. The Tyne Bridge built in 1928 is probably the most iconic. It’s known worldwide as a symbol of Tyneside. Although the bridges and tunnel were built many years apart by different engineers they can be loosely viewed as a single project because they all have similar goals. They all aim to move people and goods quickly in a region which has been one of the UK's industrial centres for hundreds of years. The High Level Bridge was a vital link in the railway network of its day. It meant there could now be a continuous and faster service between London, Berwick and Edinburgh. The Tyne Bridge eased traffic congestion on existing routes across the river when it opened in 1928. The Gateshead Millennium Bridge is a key part of the Newcastle/Gateshead Quayside regeneration project. A cycle and footbridge, thousands of people cross it every day. The Tyne tunnel is actually 2 tunnels. The first opened in 1967 letting traffic bypass the congested city centres of Newcastle and Gateshead. As it became busier over the decades – peak hour delays of 30 minutes were common – a second tunnel was added in 2011 to smooth traffic flows at rush hour. Ground conditions were a major challenge during construction of the High Bridge. Stephenson wrote in his journal that foundations were difficult to sink at high tide as the sand was too hard. Most of this work was done at low tide as a result. The bridge was made of cast iron to keep costs down. TThe Tyne Bridge is similar in design to the Sydney Harbour Bridge in Australia which opened 4 years later. The Cornish granite towers of the Tyne Bridge were intended as 5 storey warehouses but the inner floors were never finished. The Gateshead Millennium Bridge was lifted into place over the river by one of the world’s largest floating cranes. 6 hydraulic rams can tilt the bridge back to let tall ships pass. Its shape and movement have earnt it the nickname ‘the Blinking Eye’. The onshore sections of the 2011 Tyne tunnel were built using the cut and cover method. This meant workers dug a trench, built the sides and then roofed it over. Under-river sections were prefabricated, floated out, and dropped into a trench. The sections were then covered with rocks. Cow Green is a 3km (2 miles) reservoir in County Durham. At 480m it's one of the highest placed in England. The structure is 25.8m deep with a surface area of 3,219,000m². It serves a catchment area of 59km². Cow Green is a regulatory reservoir. This means it releases water into the river Tees during dry conditions so that it can be removed further downstream. Plans for the reservoir faced nearly a decade of protests as this part of Upper Teesdale was considered environmentally important. Campaigners were concerned that rare plants such as the Teesdale violet would be threatened by the project. About a tenth of the Teesdale violet's habitat was destroyed by the reservoir's construction. The rest of the area was designated the Moor House-Upper Teesdale National Nature Reserve – England's largest reserve of its type. Cow Green was the last of 3 reservoirs built in the Tees Valley to meet the growing needs of local industry at the time. The others were Selset and Balderhead reservoirs. Selset was completed in 1960, Balderhead in 1965. Cow Green continues to supply water to thousands of homes and industries in Teesside to this day. The expensive and protracted disputes in the years before the reservoir was built were viewed as contributing to a growing mistrust between the water industry and environmentalists. How the reservoir was built? Cow Green reservoir was created by building a dam at the point where a flat area of the river Tees crossed land near an old mine. The mine was previously dug for barium sulphate – a mineral used for making paint. The first day's work on the project started with a bang when Sir Charles Allison, chairman of the local water board, hit the plunger on a detonator. This set off an explosion which blew a crater on the reservoir site. Sir Charles may have chosen this violent start to the project to make a point. He was infuriated that environmental campaigners had delayed the reservoir for nearly 10 years. 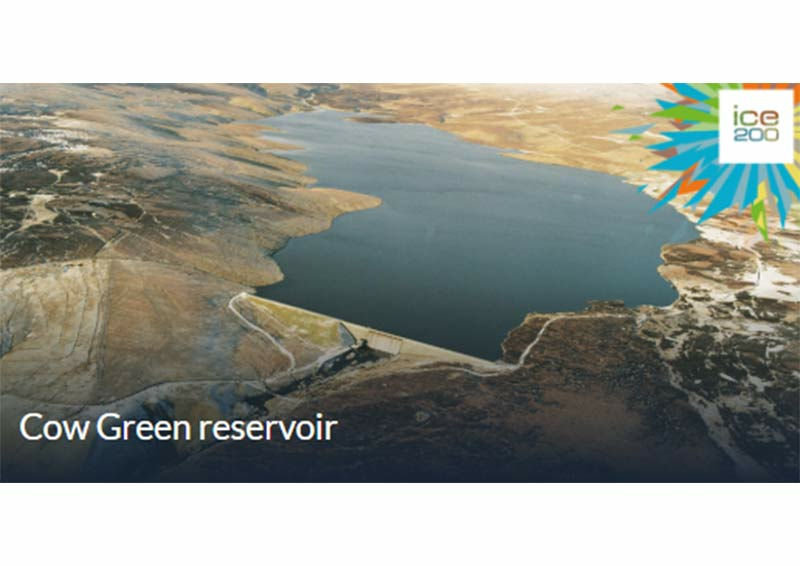 The next 4 years saw engineers build the 25m high, 550m long dam to hold back 40,000m litres of water. The project team paid close attention to the design of Cow Green's core following erosion problems with the clay core of recently completed Balderhead reservoir. Engineers decided on sand drains for Cow Green as they thought this would cut down seepage from the reservoir. Sand drains use small particles to filter impurities from water. Around 300 people made up the construction team. To help promote civil engineering achievements close to you and across the UK, we're running a campaign called This is Civil Engineering. We're highlighting projects across the North East that are helping to improve lives and improve our environment. Please see the list below for accredited centres offering engineering degree courses in the region. The UK does not have enough engineers. It is projected that UK companies need to recruit 87,000 new engineers each year to fill the 2.56 million job openings from 2012 to 2022. To do this they will have to double the number of engineering apprentices and double the number of people with engineering qualifications to meet demand. The UK needs innovative ideas to attract engineers from all areas of society to ensure a diverse workforce fit to tackle challenges such as climate change, population growth, building bigger and taller buildings and providing clean water and sanitation for all. For a chance to win a £500 prize for your school and a £50 shopping voucher per student all you have to do is get a team of between 3 and 6 together and produce a video. Students must be in Year 7. For more information about the competition, and to download a registration form, visit: our Inspire competition page.